You may remember that I recently talked about utilizing creative locations. I believe you can find inspiration everywhere, and that doing so is one of my strengths! A fun fact about this shoot is that we set a “studio” up right in this young lady’s home…proof you truly can get professional, stunning portraits just about anywhere with some hard work and ingenuity! 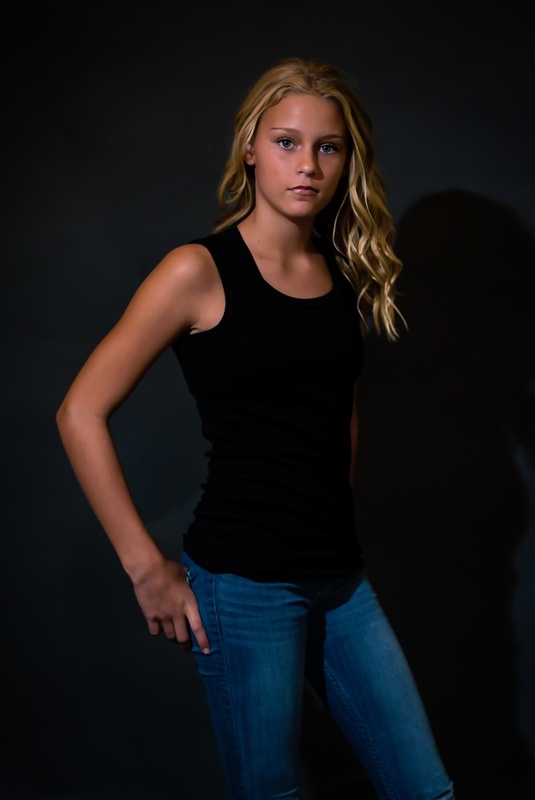 Emma attends Wertheimer Middle School and is in the 6th grade. She will graduate as part of the Class of 2025, but that’s a few years away, so for now she’s focused on keeping her grades up and living her life in a positive way. “I’d describe myself as loyal and generous”, she shared, “I recently say the movie ‘Wonder’, and that really changed the way I view people. I hope people remember me in twenty years for being a nice person”. Emma dreams of being a hunting guide one day, and really looks up to female role models who have forged ahead in this field, such as Melissa Bachman “because she is the only female hunter that has her own show on the hunting channel and she is so inspiring!” I know Emma is well on her way to becoming an inspiration to other strong young women. In her spare time, this beautiful young lady enjoys spending time with family and friends, and listening to music by Kenny Chesney and Rachel Platten (she loves the song ‘Fight Song’). For her professional portraits, we kept things simple with classic and solid colored attire. It kept the focus on her incredible eyes! We also added an elegant Michael Kors jacket with a fur hood to lend texture and interest to a few shots. I had a hard time choosing a favorite image, because these all capture her strength and grace. You may have noticed that she’s not yet a senior in high school, but I shoot portraits of many kinds. The teen years are some of the best times to have a photo session done, because many people only have baby pictures and then seniors photos; missing those wonderful years in between. If you’re looking for a portrait photographer, please let us know! I once read that creativity is like food for the soul, and that when you're an artist, amazing projects feed your heart. That is how I felt about this session with Elise, where I got to really spread my creative wings and make some art. At the core of who I am and what I do, getting to dream big has always been part of the process. There is nothing I love more than planning, scheming, and putting together something absolutely different than what I have tried before. We utilized a gorgeous Houston studio, where I was able to work with our fabulous makeup artist Kaitlyn to bring this my makeup vision to life. Elise was fabulous, and was willing to try just about anything to achieve an edgy and stylish feel. I especially love the photo of her mom taking her photo, because it captured the fun we were all having on set! Beautiful Elise is graduating as part of the class of 2020 from Foster High School. She's an incredible athlete, participating in swim and volleyball, and she enjoys being with her friends in her spare time. She also has a flair for great makeup looks, and is always up on the newest makeup trends (I'm sure she could teach me a thing or two!). I think she's got quite a lot of creativity herself, and she utilizes her seemingly endless energy by practicing her makeup skills and dreaming of doing interior or fashion design one day. As her last summer job, she also worked as a lifeguard. I really loved her denim on denim pairing here, and her super gorgeous Kendra Scott earrings (one of my favorite pieces). The shimmery red and gold makeup has a bit of a Hunger Games feel, and was "fiery", just like my lovely model! I hope to be sharing more creative and styled shoots here on the blog, so stay tuned! I have plenty of dreaming still up my sleeve! Ohhh, those teen years. I honestly don't know if given the chance, that I'd want to return to junior high. It can be so hard to maintain your own values, make and keep friends, and of course, focus on your schoolwork...all while dealing with peer pressure and a busier schedule than I remember having at that young age. But while there are many challenges of being a teen, I've found that I also love meeting and photographing junior highers and teens, because they remind me how there are so many amazing young people in the world. Sure, there are teens in the news for all sorts of horrible things, but the overwhelming sense I get as a senior and teen photographer is that they are bright, funny, kind, and lovely. They have big dreams and even bigger hearts. Kayla is one of those amazing 8th graders who I was lucky enough to photograph. She attends Briscoe Junior High School, and loves playing school sports and participating in gymnastics. "Honest, kind, and calm-natured" were the words Kayla used to describe herself, and I would agree. She cares deeply for her friends, and spending time with them is her ideal afternoon. "In twenty years, I hope my friends and family can look back and remember me as someone who was very positive", says Kayla. After she finished junior high and high school, she would love to become a veterinarian someday. For this teen session, she wanted photos that conveyed a "country" feel, and we found a wooded area, and a pretty field that captured that for her. She wore pretty tones of brown and blues, and it all worked together perfectly. Kayla, you are a delightful young woman, and I can't wait to see how your next few years unfold! The recent events in Texas and Florida have shaken all of us up, and shown us that tomorrow isn't guaranteed, and that we have to come together, regardless of differences in opinions. As I write this, I am still processing the emotions that have swept me along, and am trying to work through them. We are all horrified at the recent tragedies that have fallen on our closely-knit state, and we are all left wondering: how long will it take to recover? As a creative, and as an artist who feels deeply, it is easy to feel a bit helpless. I know art can make a difference, but it's often hard to find those opportunities practically, and that's what I want to talk about today. People say Texans are resilient and strong, and that's the truth. We have a lot of pride in our great home state, and a lot of faith in our neighbors...and, our "neighborhood" has become larger than we ever imagined. We all have different ways to help because we all have different skills. Maybe you have helped clean up the debris that piled up, maybe you have brought food to the shelters, or you are a carpenter who is helping rebuild and repair homes. As a photographer, I knew I could also utilize my skill set, so I am working with the LCISD Director of Common Threads to assist high school seniors that have been displaced due to the storm. We take pictures when our children are babies—man, do we take pictures! We take pictures when they are two, four, and six months old (if not monthly). We take pictures when they turn one, and, faithfully every year at least until they start school. We take pictures when they go on their first date, prom, and of course when they graduate. My obvious point here is that we tend take a lot of pictures! We love to document milestones in their life—as we should. However, an important stage we tend to dismiss is junior high. Seventh and eighth grades are such a time of change in both their life and in ours as parents. Yet, it tends to be the least documented; this is the age to document! Our precious children are stretching and growing, changing, discovering who they are, and where they fit inside their world. During this time, we capture the passing of an era, that is, we see traces of childhood crossing over into the young ladies and gentlemen they are becoming. Documenting with pictures is like a diary of our children for us as parents. We look back and say, “Remember when…?” I know that I, as a parent, do this quite often. I look back and it takes me immediately to that time frame and helps me to recall specific and unique events. Whether it is a funny way they said a word when they were little, or how they approached their first crush as they got older. There is always so much that deserves remembering. Don’t let there be blank pages in your diary! Want to find out more about our teen summer program?